It has certainly been that… what an adventure it has been! 2nd October 2017 – we sold our first ever ticket for The Crafty Lass workshops at the Old Grain Store workshop studio… part of me feels like it was a lot LOT longer ago, and the other part says where has that year gone?! The moment that someone bought that ticket, the first ticket, took a leap of faith – booked, paid, wanted to come. What a heart soar, what a joyous moment to treasure. However – you know what? I feel like that for every. single. booking. Every. Single. One. For every crafter that wants to come and visit, for every crafter that brings their friend, that recommends us, that leaves full of tea and biscuits and happy with their makes and creates – it makes me so so happy. Our work is done. Well, actually, as every self employed business person knows, the work is NEVER done! We are absolutely looking forward to Christmas this year – we have a much wider range of workshops on offer and are ever so grateful to the people who have reserved their spaces. Most classes are amazingly already sold out – which for the 1st October, is some pretty organised crafters! We are actually hosting our first Christmas workshop as a private booking this coming Sunday 7th October for an old dear friend and his family… travelling all the way from Bristol! And, with that love for the festive side of our year – what better way to count down to the big day than with a crafty ADVENTure and a craft advent calendar? 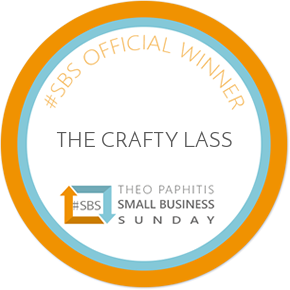 The Crafty Lass® ADVENTure has been in design stages for approximately two years – so when the opportunity came up to collaborate with such a renowned craft company as Craft Buddy – it was an opportunity not to be missed! The inspiration for the contents of the calendar have come from everything you might need to personalise your Christmas – little details to make gifts, make your home festive, your Christmas table, present wrapping, even decorate your Christmas clothes – and generally get very Christmassy! The main focus includes your ‘classic’ Christmas craft items, but also some beautiful and unusual items to make things extra special. And, one of the most magical and important qualities of the calendar is that it has zero plastic packaging inside! We are also delighted to be able to announce that the calendar will be for sale on Hochanda! If you had asked me this time last year – would I be working on my own product designs? And, would I be going back on to Shopping TV to sell said products? I wouldn’t have thought you were mad… but I would be delighted, and I am. With the calendar – we hope that you are inspired. We hope that it allows you some little time to get creative each day. Or, maybe you might like to combine items, and save some of them up for bigger crafty makes! Who knows, you can do whatever you like! We look forward to seeing all the makes and creates… Where will the ADVENTure take you?